First us is the ridiculous Cheeky Girls with Have A Cheeky Christmas – just the sort of tune you should be kicking up your heels over after enjoying too much turkey and before settling down to the Queen’s Speech. Principally famous these days for one half of the Transylvanian twins having been knobbed by useless former LibDem MP and wannabe celebrity Lemsip Nodick, the duo first came to fame on the TV ‘talent’ show Popstars: The Rivals, achieving chart success with four top ten hits between 2002 and 2004, the biggest being their debut single, Cheeky Song (Touch My Bum), which has sold more than 1.2 million copies worldwide but was voted the worst pop record of all time in a Channel 4 poll. A tad unfair, I think, as this particular offering is far, far worse…even if it did manage to scrape into the UK top 10 in 2003. Inane lyrics in comedy broken English, the CD single even included a Christmas remix of their insufferable debut, which was pretty much exactly the same song with a bunch of sleigh bells tacked on. Ugh. The second track, and the final one for this year’s Christmas Cavalcade, is not exactly a record, but I felt you masochists would enjoy it anyway. It’s a brand-spanking new version of the Band Aid hit Do they Know It’s Christmas put together by a bunch of British journalists – including former New of the World showbiz reported Dan Wootton, the Sun’s TV editor Colin Robertson and the Guardian’s Dan Sabbagh. A little bit of fun which has been doing the rounds of Twitter for the last few days, it should provide the ideal way to clear your house of any unwanted visitors over the Festive season. Have a great Christmas - I’ll be back soon with more horrific noise for you all. Here we go then, this year’s penultimate Christmas instalment. One more week of this garbage then, I promise, back to normal at WWR Towers. First up is Snoopy’s Christmas, the follow up to the Royal Guardsmen’s inexplicably popular 1966 hit Snoopy Versus the Red Baron – a number eight hit in the UK and number two in their native America. Although this particular song (just one of a slew of tracks the band released about either the Red Baron, Snoopy or both, including The Return of the Red Baron, Snoopy for President and 2006’s Snoopy Vs. Osama) did not chart in the UK or US it was, for some peculiar reason, a number one hit in New Zealand. Originally released on Laurie records in the US (and on London in the UK), the song tells the tale of how Charlie Brown’s mutt had to go out and fight the Red Baron on Christmas Eve, the two mortal enemies setting aside their differences for the night, sharing a drink and then flying off to meet another day. The ridiculously flat bass playing on Snow Man, from Bob Gerard, is typical of a great number of the offerings from Tin Pan Alley, one of my absolute favourite song-poem labels. Luckily this particular horror clocks in at just 97 seconds. Bob was the ‘performer’ of one of the best song-poems ever, Tin Pan Alley’s Jodey Is a Wise Guy, a real stinker which I may well bring you once the festive season is through. Track number three, The Christmas Shoes, came my way courtesy of Ross Hamilton. Its perpetrators, Christian rock phenomenon NewSong, should have been shot for this horrifically sentimental pap: written by Eddie Carswell and Leonard Ahlstromy this garbage, about a small boy who wants to buy his mother some new shoes that she can wear when she meets God later that night, provided the inspiration for an equally sickening film of the same name. Truly music to slit your wrists to, The Christmas Shoes made the coveted number one spot on Billboard for one week in January 2001. This song made me feel so ill I was forced to play Rock Music by the Pixies incredibly loudly just to get the evil noise out of my head. NewSong are one of the biggest acts on the Xian music scene, and founders of the Winter Jam Tour Spectacular, the United States' largest annual Christian music tour. Today’s final two ‘songs’, if you can call them that, come from Christmas in the Stars, the Star Wars Christmas Album. You may recall that we featured another track, R2D2 We Wish You a Merry Christmas, Jon Bon Jovi’s professional recording debut, here last year. Today we present a bunch of droids singing Merry, Merry Christmas and C3PO, aka Anthony Daniels, retelling the classic T’was the Night Before Christmas (retitled here A Christmas Sighting) with a suitably Star Warsian bent. It won’t be long before George Lucas decides to remaster this album, add in a CGI JarJar Binks and repackage it as Star Wars Episode 5a, or some such nonsense. On Friday I’ll bring you the final instalment in this year’s Christmas Cavalcade. Until then…enjoy! It should come as no surprise that the festive season has been providing song-poets with a bottomless barrel of maudlin sentiment for decades. Along with US Presidents, Elvis and life-threatening diseases or injuries Christmas is easily one of the most popular subjects for budding lyricists. As another Christmas approached your average song-shark would have been rubbing his calloused hands with so much glee it’s a wonder they didn’t catch fire. 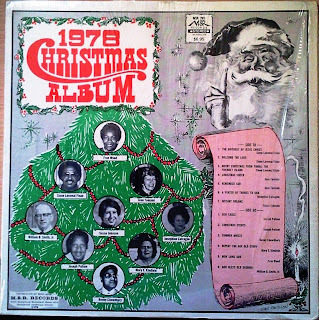 The first three tracks in today’s slice of festive hokum come from the MSR release 1978 Christmas Album. I’m not a huge fan of latter-day MSR, that omnipresent washy synthesiser is a real turn off for me (as it is for fellow song-poem collector and blogger Bob Purse), but if you look past that you’ll discover some real stinkers, such as those presented for your enjoyment today. Most of this album is just mediocre, the songs wouldn’t sound out of place playing in a lift or as muzak in a supermarket, but the first track, Merry Christmas From Tonga, the Friendly Island, which comes from the splendidly-named Sione Lavemai Finau (an author who provided the ‘lyrics’ to three tracks on this particular compilation) is an exception. 1978 was a particularly creative (and probably expensive) year for Sione, as he also managed to get a song placed on another MSR release, the Special 1978 Gospel Album. Next up is the distinctly un-cheerful Christmas Cheer, with words by song-poet Joan Tomaini. I believe Joan is being thoroughly altruistic in asking her listeners to think of those less fortunate than themselves during the Christmas period, but the line ‘does anyone ever think of those whose life compares to a dead rose’ has me in stitches. The final cut from this particular album, Christmas Events (with words by Joseph Pullum) is shameless, stealing snatches of music and lyrics from Christmas standards luckily no longer protected by copyright. It’s a jolly romp though, and wouldn’t be out of place on a 70s BBC Christmas special. 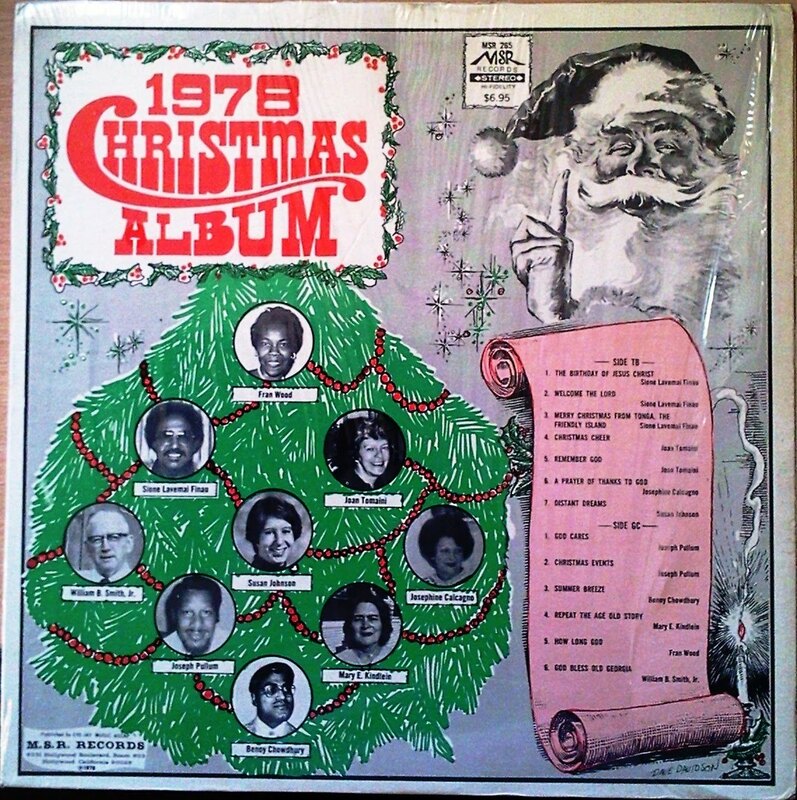 Like Sione, Joseph also decided to take another crack at the Christmas charts courtesy of MSR – he has two songs on this collection and a third, Christmas Time, appears on their album A Gift of Christmas Spirit for 1980. Last, but by no means least, I’ve included a track from another song-poem album, My Gift To You on the Royal Master label released, I’m guessing (as there’s no date mentioned anywhere) at around the same time. Sung by Linda Lane, with lyrics by Florine Fisher, Christmas is Coming is pretty standard stuff but has some wonderfully stupid words. I particularly like how mundane this particular family’s wants were – a shawl, a pair of house shoes, some gloves, a scarf, a doll, a train set and a pipe. Come on people, it’s Christmas! What about a PS3, a flat-screen TV or an iPad? 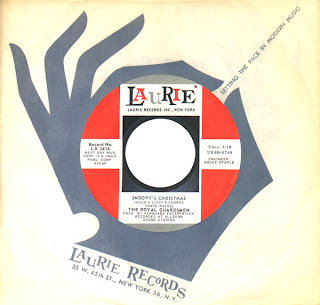 There are worse Christmas-themed song-poems out there: check out the excellent compilation Daddy, Is Santa Really Six foot Four for some real howlers, but the four I've chosen for you today have not - to the best of my knowledge - been shared on the interwebs before. So, as ever, enjoy! It’s December, which means it must be time to torture you, dear readers (and listeners) with a barrage of bad Christmas records. It’s my hope that, come Christmas Day, you’ll have enough material to compile a CD’s worth of terrible tunes; a festive farrago if you will. The music in today’s batch comes from my good friend and long-time WWR follower Ross Hamilton. I’m seriously indebted to him for bringing this first horror to my attention, as it’s one I’d not come across before: The Night KITT Saved Christmas. 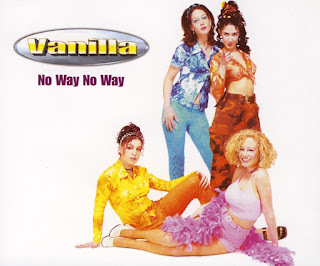 The next track, also supplied by Ross, had me laughing out loud. Based on the blind singer-songwriter Leon Payne’s song of the same name (more famously covered by Elvis Costello and the Attractions), Psycho by Thirsty Dave's Western Caravan – who claim to be the best-known, most-booked western swing band in New York - is genius. Formed in 1995 and still going strong, Psycho is taken from their 2001 album Yellow Texas Moon. The original song was inspired by a visit by the Payne to ‘see’ Hitchcock’s Psycho (according to his daughter Myrtie) rather than the long-believed story that it was composed by Payne in reaction to Charles Whitman who, in 1966, strangled his mother to death, stabbed his wife and then climbed to the top of the tower at the University of Texas Library, opening fire on the unsuspecting crowd below and killing 16 people. 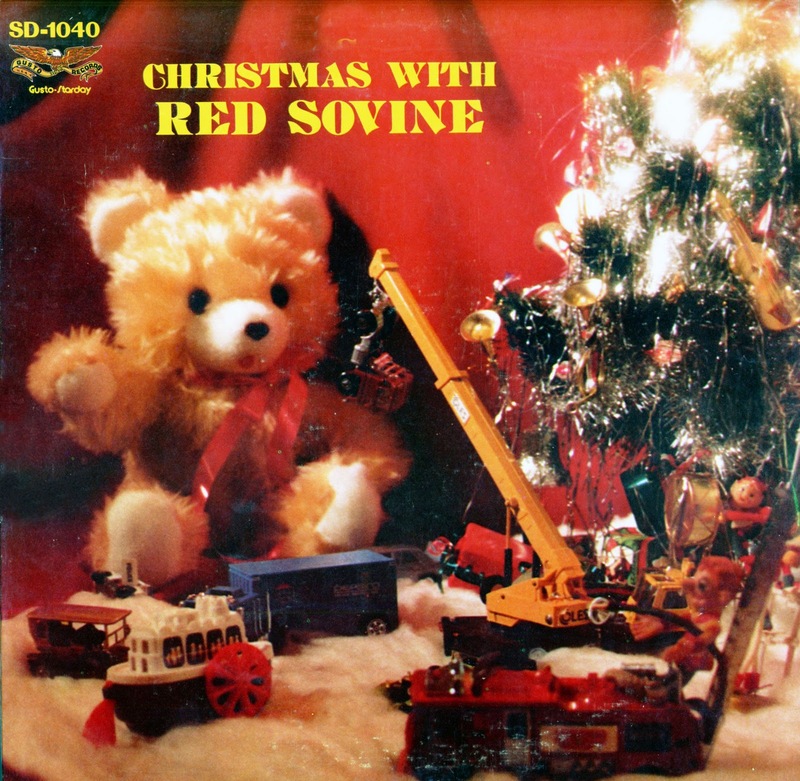 Today’s final cut is from Red Sovine, featured earlier at WWR for his maudlin monstrosity Teddy Bear. This offering, Santa Is A Texas Cowboy, is surprisingly upbeat for the master of the morose; released in 1974 and credited to Red Sovine and the Girls (it reappeared on his 1978 album Christmas With Red Sovine), it actually features ole Red singing, a break from his usual monotonous spoken-word delivery. Thanks Ross, for this batch of horrors. More next week.